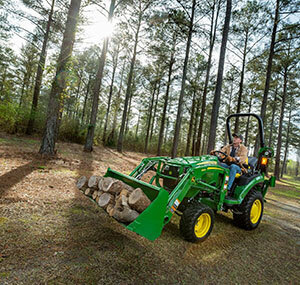 John Deere made additions and updates to its product portfolio, including utility vehicles and compact utility tractors. First up, John Deere introduced two new utility vehicles to its lineup: the gas-powered Gator HPX615E and the diesel-powered Gator HPX815E. The cargo box has removable sides and tailgate and a one-handed, pickup style opening. These new models handle more cargo volume, up to 16.3 cubic feet. Plus, the cargo box’s features allow it to transition to a flatbed. Both new models boast a 1,000-pound cargo capacity, 1,300-pound towing capacity and 1,400-pound payload capacity. Optimal weight distribution, 6-inches of ground clearance and four-wheel drive ensures the new models handle challenging terrain with ease. 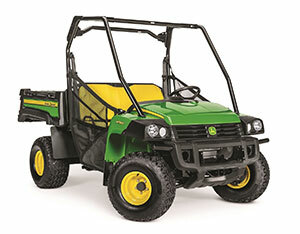 Next, John Deere rolled out the new new gas-powered Gator XUV835 and diesel-powered Gator XUV865 utility vehicles. The 54-hp XUV835 and 23-hp XUV865 offer tight turning and optimal weight distribution for off-road performance. The XUV835 reaches speeds of more than 45 mph and the XUV865 offers a top speed of 30 mph. Both models are compatible with a full range of more than 90 attachments. They also feature a 11-gallon fuel tank. As the first units in the Gator family to have three-wide seating, the new XUV835 and XUV865 include an adjustable driver’s seat, ample legroom and tilt steering to reduce operator fatigue. Available HVAC systems and pressurized cabs offer year-round weather protection. Additionally, a heating feature defrosts the windshield. The new vehicles feature a durable cargo box and a towing capacity up to 2,000 pound and 16 gallons of storage. The Gator XUV835R and Gator XUV865R come standard with a climate-controlled cab with premium cloth seating, similar to their tractor siblings. The R trim level also includes upgraded attachment ready wiring to allow quicker installation of roof lights or other electrical attachments, plus the R models come standard with brighter LED headlights. John Deere updated its 3E Series compact utility tractors. Offering a consistent styling package across the compact utility tractor portfolio, the redesigned 3025E, 3032E and 3038E are more versatile, durable and easier-to-use than ever. Color-coded controls in the operator stations are ergonomic and intuitive, increasing overall comfort and convenience during operation. The independent Power Take Off (PTO) system eliminates the need to stop and clutch to engage or disengage the PTO. A two-range hydrostatic transmission (HST) increases tractor performance while eliminating clutching for fast and easy direction changes. Twin Touch foot controls provide an automobile-like experience while reducing operator fatigue. The 3E Series machines come standard with onboard diagnostics. Critical components are protected to mitigate the risk of costly repairs, while wet disk brakes and the PTO clutch design help maximize wear life. Additionally, an increased service interval of 1,200 hours between fluid changes dramatically decreases costs spent on routine maintenance and upkeep of the machine. Other notable changes to the series include a relocated fuel tank, additional factory-installed options, more tire offerings, telescoping draft links and a 12-volt outlet on the operator station. 3E Series tractors can transform with a variety of implements, from box blades to rotary cutters, tackling any task with ease. The optional iMatch Quick-Hitch or telescoping draft links provide easy rear implement hookup in seconds allowing operators to quickly move on to the task at hand. The 2025R compact utility tractor. The redesigned 2025R compact utility tractor comes equipped with TwinTouch foot controls, allowing the operator to select speed and direction of travel with the light touch of a toe, reducing operator fatigue and increasing productivity. With the addition of the optional Auto-Throttle, the operator can automatically increase or decrease engine speed while pressing on either of the TwinTouch pedals. The 2025R also features equal forward and reverse ground speed. The 2025R’s controls are repositioned and color coded for easy identification and convenient operation. The cushion on the new seat is 2-inches thicker than the previous model and features armrests and full-seat suspension. Rubberized floor mats reduce vibration and noise to the operator. Other improvements include a newly designed toolbox, providing lockable on-board storage and the ability to remove it from the tractor. The 2025R is available with one of three tire options, including the new R3 Radial Tire, the R3 Bias Ply Tire and the R4 Industrial Tire. Additionally, the 2025R features the AutoConnect mid-mount mower deck. The updated Height of Cut system allows for quick and easy adjustment of the mower deck with the push of a button.